Scotland goalkeeper Craig Gordon is focused on returning to full fitness before signing for a new club. 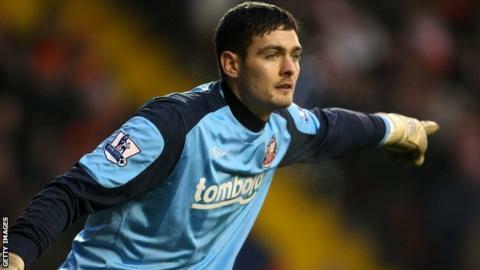 The former Sunderland goalkeeper is sidelined with a knee injury and has yet to settle his domestic futre. "I'm just trying to get back fully fit with that before I start looking for a club.," he told BBC Scotland's Sportscene. "I've still had a few niggling problems with my knee injury, which I've had on and off for quite some time now." Gordon began his career at Hearts before a £9m move to Sunderland in 2007 made him the most expensive British goalkeeper. However, a knee injury midway through his second season with the Black Cats left him sidelined for several months. And, only four months into the following season, a broken arm kept him out for another three months. Further injury woes struck when Gordon broke the same arm in pre-season training in 2010, and, in April 2011, Gordon underwent knee surgery which kept him out for another eight months. Gordon was released by Sunderland at the end of the 2011-12 season.